McPherson College Associate Professor Dustin Wilgers later this week will be leading a program that is near and dear to his heart – never mind that many people often shudder at the thought of chasing spiders as darkness falls. But that’s what he’ll propose people attending do, arming themselves with headlamps or flashlights and tracking down spiders and ultimately catching them in vials that he’ll bring along. The community Spider Walk Night is set for 8 p.m. Friday at the Lakewood Discovery Center, an event sponsored by the Smoky Hills Audubon Society. The event is especially geared toward children, but anyone can attend; there’s no cost to attend. Wilgers will briefly talk about the spiders and show tarantulas he plans to bring along. After that, he and everyone attending will head to the trails and go in search of spiders. Although it might seem difficult to locate spiders after darkness falls, there?s an easy way to do so, he said. With the aid of a flashlight or bright headlamp, spiders? eyes reflect back the light, thanks to a mirror in the back of their eyes. Those lights open a door into the world of spiders. Of course, during the daylight, spiders are “very camouflaged,” he said. Lights must be bright enough, and small headlamps or phone flashlights typically aren?t bright enough to do the job. For the most part, the spider that will be the target of Friday’s search will be the wolf spider, an active spider. Participants will use vials Wilgers will bring with him to capture the spiders, putting the vial over the top of them. Spiders have a natural response to that, by essentially crawling up inside the vial, even if it seems to be too small for the spider. There are about 500 species of spiders in Kansas, out of the almost 4,000 species in the United States and nearly 50,000 species worldwide. “The majority of spiders have venom that they use to subdue their prey,” he said. Scary as that sounds, Wilgers was quick to add that there are just a few “especially here in Kansas ” that have venom of any medical significance. Those include the commonly known black widow and brown recluse spiders. There’s also the yellow sac spider in the northeast part of the state, an introduced species. In addition to the tarantulas, Wilgers also will bring a children’s book he’s written about spiders. The book is aimed at children 5 to 10 years old. It’s a story about a spider that goes to elementary school, and is given an assignment to help her find her class. Of course, it uses science to learn the assignment, and introduces the idea of a fly smoothie for lunch, for example, representing how an actual spider eats. The paperback book has only been out four months now and already about 600 copies have been sold. The books cost $7.62, including tax, and a portion of the proceeds to to the Kansas Chickadee Checkoff, which helped fund the book and covers the cost of travel to similar spider walks for Wilgers. The books will be available for sale Friday. 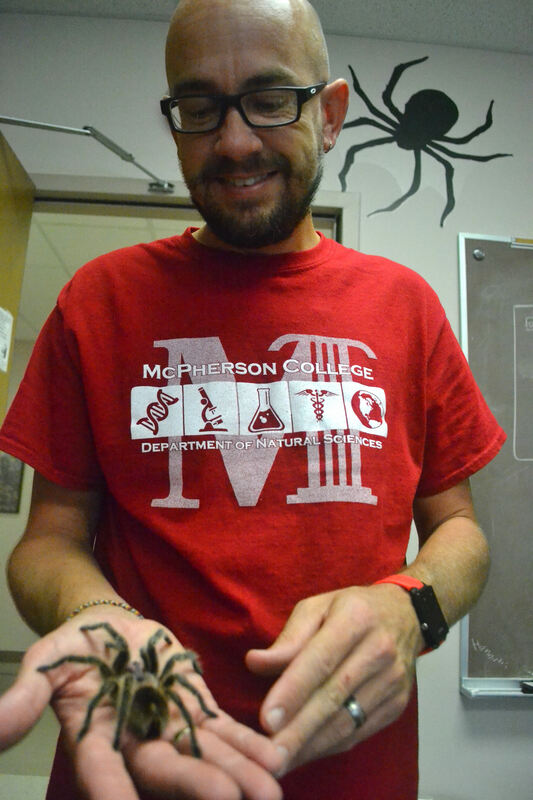 McPherson College Associate Professor Dustin Wilgers holds a tarantula he plans to bring with him to a spider walk at 8 p.m. Friday at Lakewood Discovery Center, sponsored by Smoky Hills Audubon.